A cruise around Spitsbergen gives you ample opportunity to explore all the aspects of this fascinating arctic island. See the great eastern nature reserves and some of the most spectacular highlights of the Arctic. We aim to take you well above the 80th parallel and placing you closer than 600 nautical miles from the Geographical North Pole. The eastern part of Svalbard is more barren and characteristically High Arctic, compared to other places that we visit with the M Fram. During this voyage, you will see some of the most spectacular fjords of Spitsbergen. The eastern part of Svalbard is mainly divided into two large nature reserves and combined, they represent one of the largest and mainly untouched, wildernesses in Europe. Traversing the large fjord east of Spitsbergen will give you spectacular views of the island's east coast, with hundreds of glaciers and mountains. If we are lucky, we'll meet some of Svalbard's marine mammals like seal and walrus and wherever there is ice, there is a great chance of spotting polar bears ! Your Arctic adventure starts with an evening flight from Norway's capital, Oslo. Before departure, you can spend some time exploring this fjord-side city surrounded by forests, lakes and hills. Oslo offers a varied architecture, top-notch restaurants and endless shopping possibilities. The contrast will be significant when you arrive in Longyearbyen a couple of hours later. On arrival, you will be transferred to your hotel. Spend the morning exploring Longyearbyen and its surroundings, before embarkation in the afternoon. Longyearbyen is a Norwegian settlement often referred to as the capital of Svalbard. This is a lively small town, situated amid some incredible Arctic landscape. Barentsburg is a Russian settlement with an exotic collection of Russian artefacts and architecture and is very different to Longyearbyen. The museum, library and newly opened brewery function as meeting points and a research station is under construction. See a colourful folklore show and visit the hotel and museum. Experience a different side of Svalbard - a little piece of Russia in the Arctic. You will board your expedition vessel in the late afternoon. The North West Corner is scattered with islands, fjords and beaches and has a long history of exploration. The ocean here can be full of drifting ice especially in the early season and the frozen landscape changes constantly. Due to strong winds and currents, the Captain monitors conditions closely before deciding where we can land or sail. This is why all our itineraries are flexible; we work with the elements, not against them, and safety is our first priority. 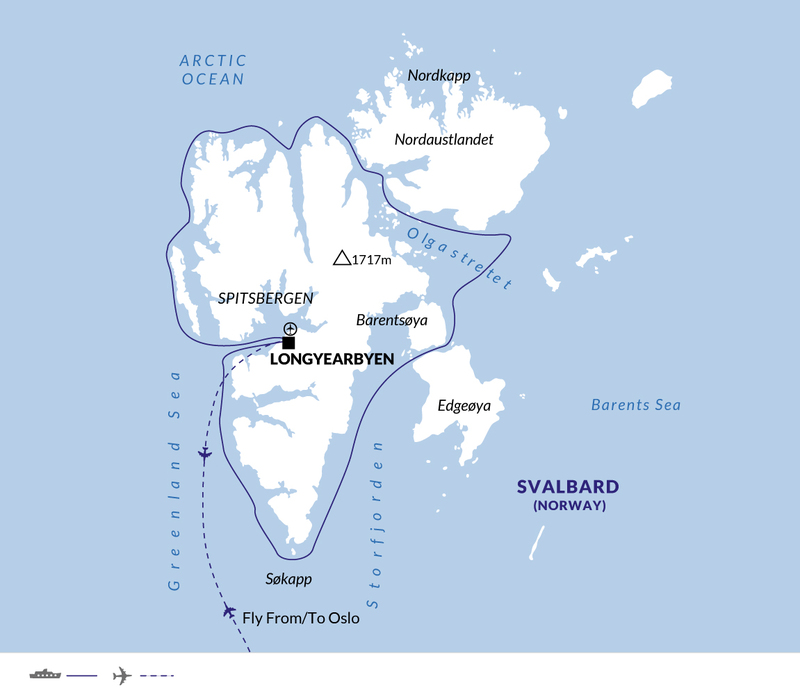 If we are able to land, this area is excellent for exploring Svalbard's history. We might visit Kongsfjorden, considered one of the most beautiful fjord areas in Spitsbergen, with mighty glaciers calving icebergs into the sea - all framed by stunning mountain formations. On the shore of Kongfjorden, is the former mining settlement of Ny-Ålesund, now an international centre for research, with a picturesque mix of old and new buildings. Cruising in the north west corner of Spitsbergen, we will make a stop at Raudfjorden, which offers fanatastic hiking opportunities. Later, we continue deep inside the giant Woodfjord system to visit the enormous and fast moving Monaco Glacier. In front of this dramatic glacier, the mixing of fresh and saline water creates an excellent feeding ground for sea birds including kittiwakes, fulmars and glaucous gulls. The icy-blue colours of the glacier, make this an excellent site for photography. Eastern Svalbard boasts the highest population of polar bears on the archipelago - we really hope that we'll get the chance to see one on this journey! Today, we'll explore Sorgfjorden, which borders the North East Spitsbergen Nature Reserve and was the location of a famous 17th-century battle between whalers. Enjoy the view from the deck as we pass the spectacular bird cliff of Alkefjellet, one of the largest of its kind. Storfjorden will offer us spectacular views of the east coast of Spitsbergen, with hundreds of glaciers and mountains in the distance. If we are lucky, we might meet some of the marine mammals of Svalbard, such as walrus and seals. We make our way to the southern cape and the southernmost tip of Spitsbergen, where Hornsund hosts a wonderfully varied landscape and geology. Ice being pushed into the fjord early in the season attracts polar bears that hunt on the floes, so with a bit of luck, we may spot some of these magnificent predators. Isfjord is the most extensive fjord system in Svalbard. We will spend the day exploring both the outer and the inner parts of the fjord. One of the most striking features of the outer part is the Alkehornet peak, where thousands of Brunnich's guillemots nest during the summer season. In the inner parts of Isfjorden, the landscape changes constantly. The immense U-shaped valleys, carved out of the mountains by the giant glaciers that covered the area some ten thousand years ago, are home to large populations of the endemic Svalbard Reindeer. In the late afternoon, our Expedition team will search for a scenic bay for our farewell dinner - an on-board barbecue in the most beautiful Arctic surroundings. We call at Longyearbyen after midnight, where our voyage comes to an end. You will be transferred to the airport in the early morning for your onward flight to Oslo. Pack comfortable, casual clothing for all activities. Wind and waterproof outer layers are essential, and a jacket is provided in the cost of the cruise. Beware of tight clothing that leaves no room for trapped air, which is an excellent insulator. Wool, silk and some of the new synthetic fibres, like polar fleece, retain heat better than cotton. A wind and waterproof jacket is provided as part of the cost of your holiday. Waterproof boots are available on-board, free of charge. Ensure that you take good walking boots with you and trainers for relaxing on the ship. Crocs shoes also offer good grip when out on deck, if you prefer to take these in place of trainers. Tipping is collected at the end of the voyage and is divided among the crew. Tipping is a very personal matter and the amount you wish to give is at your discretion, but as a generally guideline, we suggest US$12 per person per day. The MS Fram is a comfortable vessel for your polar exploration with modern amenities such as a fitness room, Jacuzzi and sauna. The ample indoor and outdoor public spaces are designed to ensure you enjoy the passing scenery and wildlife sightings; each table in the restaurant has scenic views and the observation lounge has panoramic windows. There's also a selection of shore excursions to choose from, allowing you to experience as much of the polar wilderness as possible. Prices are based on the use of inside, category one cabins on decks 3, 5 and 6. Category one cabins are based on twin share, with one bed and one sofa bed. They are comfortable with a private toilet and shower, fridge and TV. The MS Fram has a number of different cabin categories, many of which are outside facing, with two beds (apart from superior cabins and suites, which have double beds). Some cabins have portholes and others, larger windows and sitting areas. All cabins are twin share, but we can also offer single occupancy at a supplement, if you are travelling alone. Call us for details on the cabin choice to fit your requirements. On-board the ship all meals are included in the price of your expedition; a buffet breakfast and lunch, and set menu dinner; it's free seating for breakfast and lunch, and assigned for dinner. Vegetarians and some special dietary requirements can be accommodated with advance notice, please advise us at time of confirmation. Coffee and tea are provided free of charge. All other beverages, alcoholic and non-alcoholic, are not included and can be purchased in the bar. Entry visas NOT required by UK, AUS, NZ, USA, CAN Citizens. Other nationalities should consult the relevant consulate.